Lawyers have long been the punchline for jokes, whether it be for their ambulance chasing ways, or for having a penchant for greed and chaos, or charging an armload for their services. However, there are a number of services out there that are trying to make the legal profession’s web presences less of a laughing matter. While there’s a perception that most lawyers work in big law firms, 80 percent of the legal market is comprised of solo practitioners or small firms. With meager support staffs and no IT departments to speak of, these solo practitioners and small firms quickly become over-burdened with the administrative side of their business. That’s where services like Clio come in. Clio is a web-based management tool for the legal industry, providing lawyers with collaborative and secure ways to manage their practice and interact with clients. Today, the cloud-based management service is announcing that it has raised $6 million in series B financing from Acton Capital Partners, a Munich-based growth equity fund and Point Nine Capital, an early-stage VC firm based in Berlin. This brings Clio’s total funding to $7 million. The company will use this new infusion of capital to push product and feature development around its technology, add support for its growing customer base, and expand internationally. Currently, the U.S. represents 95 percent of Clio’s customer base, and Founder and CEO Jack Newton says that he wants to change that and is eyeing Europe, Canada, and Australia. While the legal industry has been largely perceived as being slow to adopt modern technologies, Clio’s opportunity lies in helping transition the many small practices out there to the cloud. Like MyCase and Rocket Matter, Clio wants to make it easy for lawyers to manage their practices from a cloud-backed web management system. 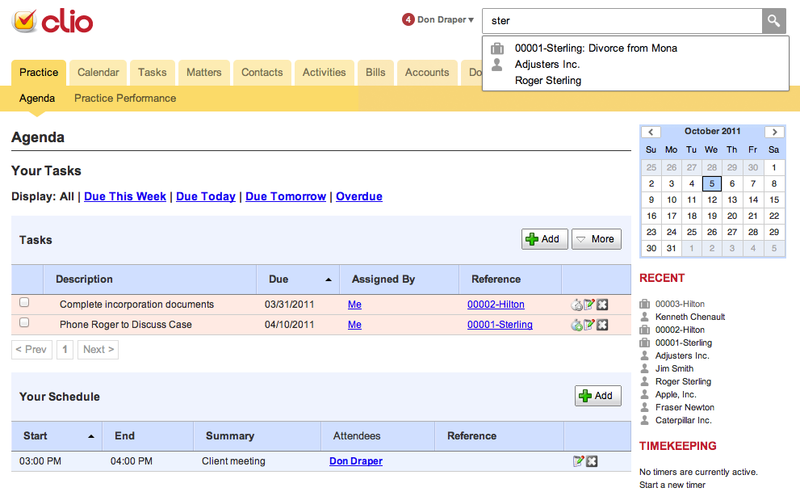 The service enables lawyers to keep lawyerin’ by tracking notes, time, and client information for all of their cases. Maintaining a diary of all one’s cases is essential for most litigators, and Clio helps small practices keep tabs on upcoming court dates and deadlines all in one place, enabling them to add a slew of individual cases into one task list, all without having to hire a support staff. Integrating with Google Apps, too, helps lawyers sync their schedules with Google Calendar as well as sync contacts and take advantage of a single sign-on. Beyond case and billing management, Clio also enables small practices to take advantage of trust accounting and detailed reporting, and offers a secure portal for exchanging information and collaborating with clients, in addition to an offline time-capture application. As with so many other industries, legal practices are moving to the cloud, and Clio has been one of the pioneers in helping the industry move forward. With $6 million in new funding, expect that legal train to keep on rolling. For more, check out Clio at home here. Bonus, courtesy of Clio: The first 60 users can click on this link to register for a complimentary 3 months.